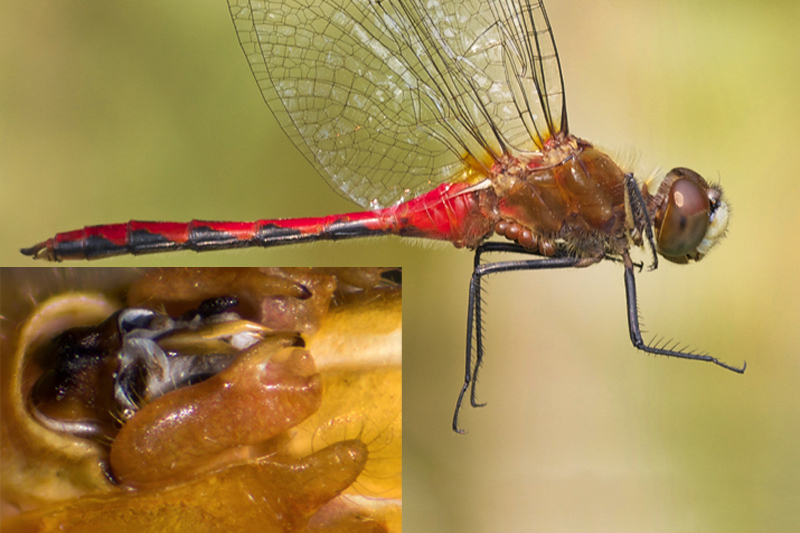 [View PDF] White-faced Meadowhawk (Sympetrum obtrusum) main photo: Scott King. 2015-07-03 Roseau County, MN; inset photo: Curt Oien. distribution One of many far Northern meadowhawks, this species' southern end of the range barely reaches NC, where limited to the extreme northern mountains. Records only for Ashe, Watauga, and Avery counties. abundance Presumed rare in the very limited portion of the range, though it has been found in recent years in each of the three counties within the known range. flight Mid-summer to fall only, with the NC records from 8 August to 2 October. habitat Still or slow-moving water of lakes, ponds, slow sections of streams, marshes, and bogs. behavior Adults forage in nearby fields or clearings near water, perching on the tips of grasses and forbs. comments Males have intense red abdomens and a white face, rendering them very striking. However, Ruby Meadowhawk males are also bright red, though their face is not white. Ted Wilcox has provided several excellent photos from Ashe County, which provided a new county record; Curtis Smalling photographed one in 2011 from Watauga County; and Ed Corey added an Avery County record in 2008. Duncan Cuyler's database has a record just for Watauga County. Comment: Ashe County, 2005-10-02, male. Although the white face coloration is suggestive of S. obtrusum, positive identification to species is not possible based on this photo because it does not clearly show the hamules.